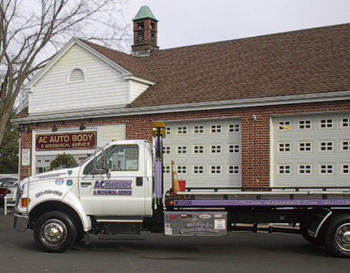 Our new fleet of towing vehicles includes flatbed tow trucks and winch-out service. If you are unable to get your car to us because it doesn't run, our tow trucks are available 24 hours a day to assist. Our fleet is well-equipped for any roadside situation. If your vehicle needs any major auto body or mechanical repairs and is not in driving condition, one of our tow trucks will be sent out to retrieve it immediately. As an added convenience we can even arrange for a rental car to be made available to you!